I love food. My favorite place on the planet (other than my own kitchen) is Whole Foods. I love cookbooks and spend most weekends watching the Food Network and cooking. BLAKE MAKES is something fun for me and Bridget (my wife) to do. It’s part of doing what you love, and loving what you do. I have some big plans for this blog, but for now we are just going to share with you all things food. 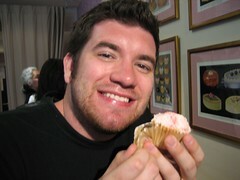 This is me at a cupcake bakery in London. I’ve been doing Blake Makes for over a month now, and I’m loving it more and more. I have so many ideas and am getting tons of feedback from all my readers. I hear you all. I will be doing some desserts. I want to because they take great pictures, but I avoid them because I’m on a diet. I’ve also gotten tons of requests from friends (7-layer taco dip), so you’ll be seeing my takes on all of these in the coming posts.